In the James Bond classic, You Only Live Twice, there is a gruesome scene where the evil Blofeld tosses a piece of meat into a piranha pool and it comes out as a clean bone. Later in the film, a woman is thrown into the pool – the result left to the viewer’s imagination. Native to South America, piranhas gather in large schools and are attracted by commotion in the water and by the scent of blood. Piranhas have sharp wedge-shaped teeth that work like shears and cut through flesh easily. Their main diet is fish and, only a few species are considered dangerous to humans. 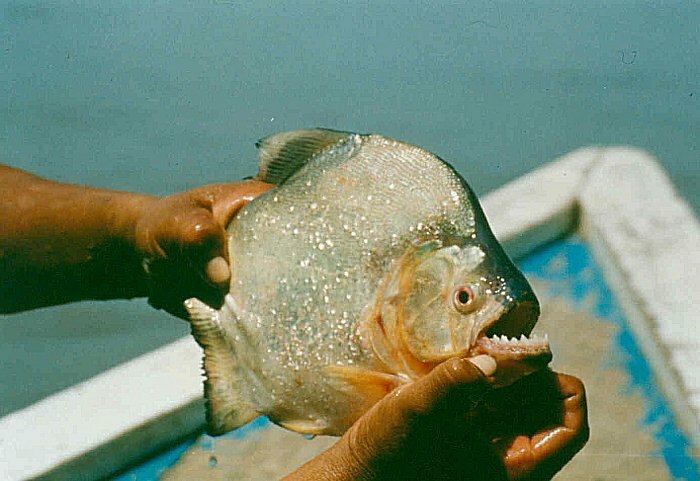 Some piranhas are in fact vegetarians. The word piranha comes from the Tupi language. It means literally fish with teeth.